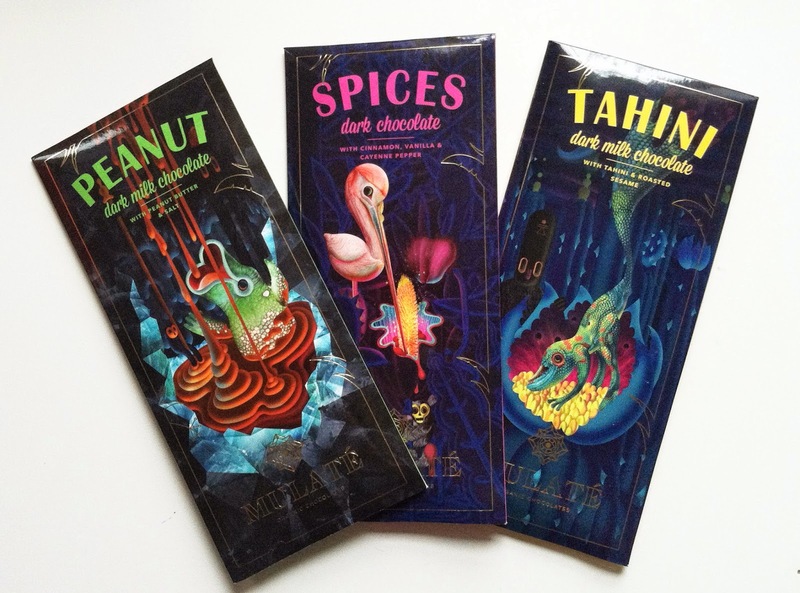 My friends at the house of Lithuania based Naive, sent these beautifully packaged, oversized, organic bars from their new Mulate Organic Chocolates collection. I've always said that a well dressed, well executed bar of chocolate makes for fabulous gifting. You can't lose with one, or three of these arty bars dressed in a ribbon. I'm presently munching on the Peanut, dark milk chocolate. No actual crunch here, it's all about the subtle perfection of the salty peanut butter flavor brilliantly paired with creamy chocolate. Very well done, and it's gluten free. This is award winning chocolate. Hands down, a top choice for gifting this season. The packaging, featuring artwork by Gediminas Siaulys (PetPunk) is worth noting. I have to add that the package reads: "Welcome to the faraway land of Mulate, the island of Cocoa Gods," Where exactly is that? "...between the tropics of Capricorn and Cancer, the shores of a small, mysterious island." I'll tell you what, this bar totally swept my senses away.